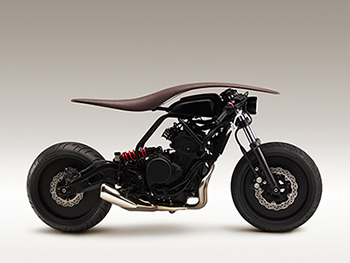 Home > News Release > 2015 > Yamaha Corporation and Yamaha Motor Co., Ltd. to Present Joint Exhibit at Design Event in France Theme: "project AH A MAY"
Japan, February 16, 2015 — Yamaha Corporation and Yamaha Motor Co., Ltd. will present a joint exhibit in the "Ninth Edition of the Biennale Internationale Design Saint-Etienne 2015" from March 12 through 22. This will be the second time for Yamaha Corporation to have a booth at the event (the first was in 2013) as well as the first time for the Yamaha Corporation and Yamaha Motor Co., Ltd. to jointly exhibit at the event. The theme of the exhibit will be "project AH A MAY." In preparing for this project, the design divisions of the two Yamahas exchanged their design fields, and, without any constraints related to production or commercialization, created designs according to each Yamaha's method and way of thinking. These two Yamahas went about designing these products with the understanding that their products would be mirror images of one another. The goal of this project is for the designers to stimulate each other's imaginations and seek to create products that embodied their shared image of "Yamaha." By taking the meters on the instrument panel off the motorcycle rider's view, the idea of the design is to enable him or her to be a part of the passing scenery. The form was created to flow from the seat to the fuel tank and was inspired by a horse motif that aims to give a sense of unity among people, nature, and the vehicle. 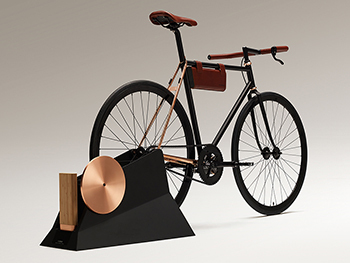 The electric-power assisted bicycle is placed on a recharging stand, and when cyclists pedal it, this recharges the battery. The battery power can then be taken out of the stand and the electricity generated shared with the family and used to power musical instruments and other electric appliances. The design aims to suggest a lifestyle that takes a positive attitude and approach toward power usage. Designed by Design Center, Yamaha Motor Co., Ltd. This design seeks to create an ideal form that will allow human beings to go beyond existing methods to express themselves. 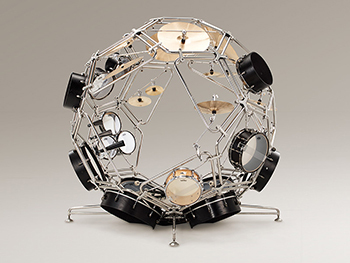 The design resembles a globe and allows performers to let their imaginations run wild on an assortment of different kinds of drums. Energy erupts centered on the performer and creates an increasingly visually dynamic world of sound. This marimba is designed for two performers and allows them to add and multiply their energy. 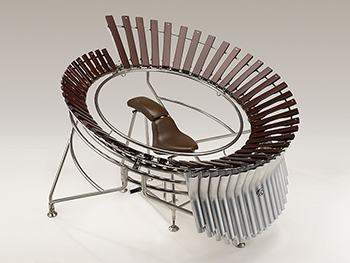 The seating of the performers brings to mind the image of a two-seater motorcycle and enables the performers to enjoy the thrill of unexpected swings and gaps as they play the marimba. * The biennale itself will be held from March 12 to April 12. Joint Branding Activities of Yamaha Corporation and Yamaha Motor Co., Ltd.
Yamaha Corporation and Yamaha Motor Co., Ltd. have planned and conducted many kinds of events in areas where the two Yamahas have mutually strong relationships. These have included the "Yamaha Ladies Open Katsuragi Golf Tournament," the "Planting Trees in Indonesia" project, and the "Manufacturing Classes." Among these also have been activities in the field of design where the two companies have considerable affinity and significant synergies. These joint activities have included sponsoring "the Graphic Design Award by Yamaha" and joint exhibits in the Good Design Awards as well as displaying musical instruments at the Tokyo Motor Show venue. These activities have been planned and held jointly by the two companies that share the same brand under the theme "Two Yamahas, One Passion." Yamaha Motor Co., Ltd.: "Yamaha Motor Design"
Note: Information on products, divisions where spokespersons can be contacted, and other matters in this news release are as of the date the release was issued. Please be aware that these may change at a later date.